The "image" (AF130714-1833hp) is registered by A. Arthur Fisher with the U.S. Copyright Office under certificate VAu 1-149-081. The image may not be scaled, resized, cropped, obscured, renamed or modified in any way, whatsoever. 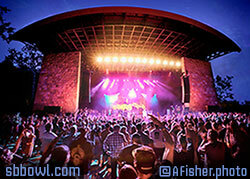 Image of Santa Barbara Bowl by A. Arthur Fisher. Used with permission. The image may not be sold or leased. The image may not be included in or on any item that is for sale, nor may it be used to promote direct or indirect sales of any kind, including ticket sales, except for face-value ticket sales for purchase directly from AXS.com. The use may not “paint” either the Santa Barbara Bowl or A. Arthur Fisher in a "negative light." The use may not be used to imply any endorsement by the Santa Barbara Bowl. This license is granted from 1/1/16 through 12/31/20. After that time, the source link may expire. A. Arthur Fisher and/or the Santa Barbara Bowl has/have final authority in determining if any particular usage violates this license. We reserve the right to terminate permission to use images and brand of each company. If you are interested in this or other images for commercial use (uses outside of this Public Use contract), or if you have any questions about this Public Use image program, please contact the Santa Barbara Bowl or A. Arthur Fisher.